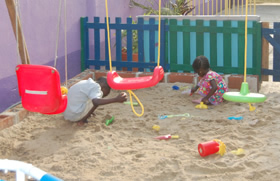 We are a leading provider of high quality child care services situated in Alagomeji, Yaba, Lagos. To be the leading provider of Childcare Services in the areas where we operate,providing a friendly and creative environment,offering peace of mind while parents are away. To be the preferred provider of high quality,contemporary Childcare and AfterSchool Services,operating from our own facility,offering services in a warm,friendly and happy environment to at least 130 children,bringing peace of mind to parents while they work.